For the last four years my students have been "doing" science by field mapping their campus. They choose a "sit spot" and using a check off list, seek to count and identify birds. Armed with binoculars, field guides, and check-off sheets created for the various habitats of our campus, they spend an hour weekly engaged in field science. The data they collect is compiled to create a school-year-long snapshot of Gordon's wild birds. They create graphs and hypothesize why the birds that are plentiful in the fall are not there in the winter. They are creating life long schema that helps them understand the natural world. What they understand, they will care about. And what they care about they will be more likely to save. I seek to empower students to save our planet, one bird count at a time! 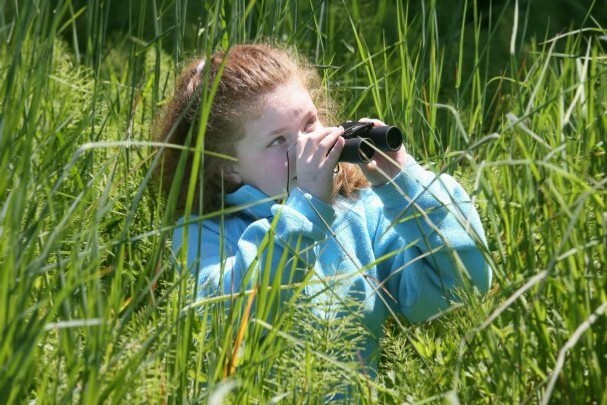 Learning to identify birds is one way students learn about Field Mapping.